Join us for this December tradition: a dozen (or more) five-minute lightning demos/talks from the members of CloudAustin and the Austin technical community! This annual event brings together the members of several local technical communities for a chance to meet, learn, and celebrate a successful year. 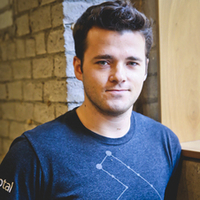 Ethan Brooks, Toptal’s North America Community Lead, will be among the speakers. His talk is titled How to Set a D.A.M.N. Goal and will present a goal-setting framework anyone can use to be more effective. For more information and to RSVP, please visit the official Meetup page.